NEW YORK (RNS) — It’s been five years since the College of Cardinals plucked Jorge Mario Bergoglio from Argentina and made him pope — a rock star of a pontiff to much of the world, but a disappointing leader of the Roman Catholic Church for many traditional Catholics. At Fordham, one of the country’s elite Catholic universities on Wednesday (Jan. 31), New York Times columnist Ross Douthat — a Francis critic — and Villanova University theology professor Massimo Faggioli — a Francis fan — sparred over the pope’s legacy before a crowd of more than 250. The event, “Francis@Five: Assessing the Legacy of Pope Francis Five Years After His Election, reflected a tension within the larger church, which claims of 1.2 billion adherents worldwide. While aspects of Francis’ papacy could be considered successful, the pontiff’s tenure was a “disappointment” in several ways, Douthat argued at the event, which was co-hosted by the Religion News Foundation (of which RNS is a part). “There are, I think, reasonable questions about whether the church is drifting toward a kind Anglican model of papal government around faith and morals — a kind of decentralization where Catholic teaching looks different in Warsaw than it does in Berlin,” he said. Faggioli holds a far more optimistic view of Francis’ legacy. “This papacy, I believe, is a success because it’s not about Francis — it sounds obvious, but it’s about Jesus Christ,” he said. He pushed back on any attempt to assess papacies based on concepts of “continuity,” which he described as “unhelpful,” and seemed to praise the pope’s embrace of those who feel rejected by the Church. Douthat has often been associated with what former RNS reporter David Gibson, head of Fordham’s Center on Religion and Culture and moderator of the debate, described as a conservative “opposition” movement against Francis among Catholics. Although there are Catholic clergy attached to the movement, its loudest champions are often laymen such as Douthat who write about Francis in a unofficial capacity. When asked to assess the scale in influence of the pushback to Francis, Douthat insisted the resistance is small, but representative of a larger struggle. Faggioli wasn’t so sure, and repeatedly dismissed Douthat’s polemical language. The conversation often circled back to the question of whether Francis was fundamentally altering the church, and if his doing so could result in a “break” or schism. Douthat said Francis’ actions will push many Catholics away from the church — if not immediately, then eventually. “That is the change of the Francis era: That it is now possible to say definitively that the papacy allows for changes around these contested issues of sexual ethics…that’s a big change, don’t you think?” Douthat asked. “No,” Faggioli replied as the crowd erupted in laughter. The two did acknowledge broad points of agreement. Both praised Laudato Si, the pope’s 2015 encyclical on the environment. They also expressed varying levels of support for women deacons, with Faggioli saying he hopes it happens “tomorrow” and Douthat describing himself as “agnostic” on the issue. The exchange also seemed to smooth over — or at least ignore — previous questions about Douthat’s credibility in Catholic discussions. In 2015, several Catholic theologians and scholars, including Faggioli, published an open letter to the New York Times condemning Douthat’s writings in the New York Times as “unapologetically subject to a politically partisan narrative” and dismissing him as someone who “has no professional qualifications for writing on the subject” of Catholicism. 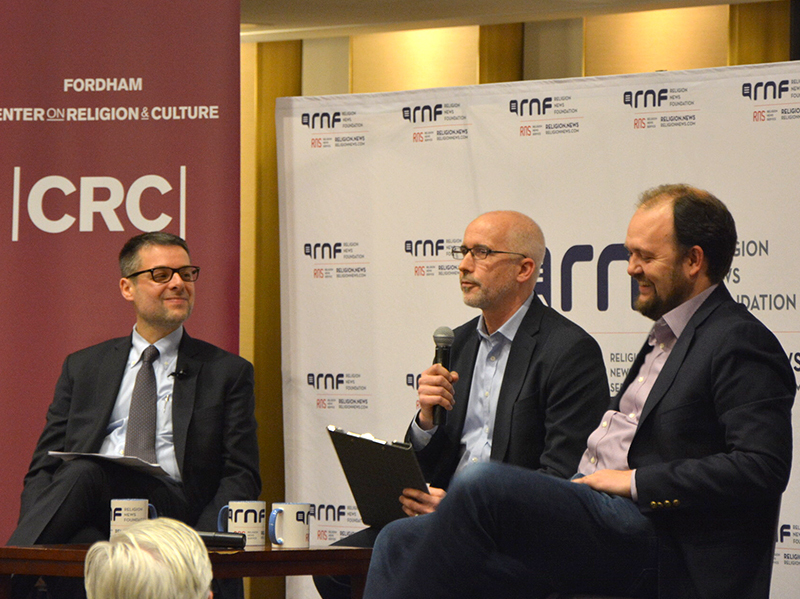 Yet Wednesday’s event was something of a legitimization for Douthat among academics, as it’s at least his third public event with religion scholars in as many months. Faggioli, for his part, took Douthat’s arguments seriously, and both agreed that debate and conversation were necessary. Still, Faggioli voiced a far less rigid view of Catholic teaching. “The Catholic tradition is not a mineral, it’s an animal. It moves. It adapts. It grows,” Faggioli said. What a joy it was to watch and listen to the very Italian, Massimo Faggioli, talk theology. We need more of this. American Catholics are missing out on the deeper dimensions of their faith.